Quick update this afternoon as our second round of snow has started to develop across the southern metro area. General consensus is that some locations will see a few more inches of snow by midday Saturday, with the best chances being across the southern suburbs and down into Castle Rock. Most of the accumulating snowfall will occur Friday evening into Friday night. We have broad-brushed Denver with 1 to 3 inches of additional snow, with 2 to 5 inches further south and west. A few locales may get a bit more than that, but overage expect snow totals to remain on the lighter side. Temperatures will remain quite chilly through the period. Overnight lows tonight will fall into the teens for most locations, so any snow that does fall will make travel difficult. Highs Saturday will remain cold, with most spots hovering in the mid 20s across the metro area. Snow continued in the mountains today where widespread totals in excess of 20 inches has been common. Snow across the higher terrain will slowly diminish in intensity overnight Friday, with sparse accumulation expected during the day Saturday. If you are planning on heading to the mountains to ski this weekend, please be safe! 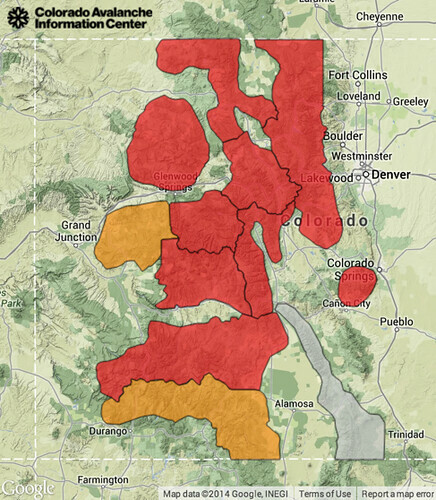 The Colorado Avalanche Information Center has issued an avalanche warning for much of the Colorado high country through Saturday morning. Enjoy the very wintery evening ahead!